Complete oval with 6″ curves and 124mm (4 7/8″) straight pieces. Includes a re-railer and feeder track. 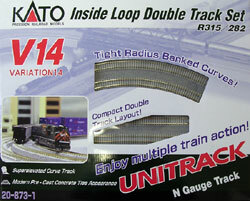 Semi-circle of track with 6″ curves and Two 6″-45 degree Compact turnouts. 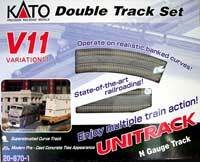 Also includes two Kato turnout control switches.